This highly desirable vintage 18-year-old Speyside malt with great Sherry character was distilled in 1967 and bottled in 1986. Good labelling and very top shoulder level. From Macallan, one of the most prestigous single malt Scotch Whisky distilleries. 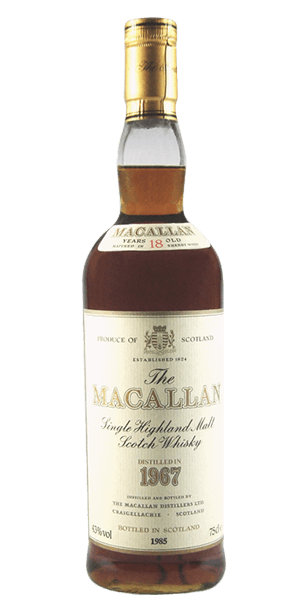 What does The Macallan 18 Year Old 1967 taste like? The Flavor Spiral™ shows the most common flavors that you'll taste in The Macallan 18 Year Old 1967 and gives you a chance to have a taste of it before actually tasting it.